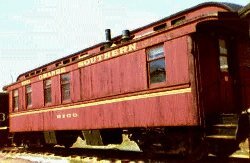 Originally built by the Denver & Rio Grande Railway as postal car No. 4, in 1882, it was rebuilt into excursion car No. 569 in 1888 and sold to the Rio Grande Southern a couple of years later. Its first number on the RGS was C-3, when it was classified as a "construction-diner." In 1892, after the railroad was completed, it was rebuilt as a business car and named "Rico." About 1909 the name was changed to "Montezuma" and in 1917 it received the number B-21. When it was transferred to work service in 1933 it became the O21. RICO can be visited at the Colorado Railroad Museum. Copyright 2000, Rocky Mountain Railroad Club.